Earlier today, the U.S Patent and Trademark Office granted a patent to Apple (via AppleInsider) addressing in-vehicle navigation and information systems based on touchscreens offering tactile feedback. The feedback would allow users to operate their vehicle's systems in a safer manner while keeping their eyes on the road. The disclosed invention, including co-pending applications incorporated by reference, contains unique embodiments which allow one to interact, by feel, with a display, called herein a "programmable tactile display". It encompasses two main focus areas: A display having features commonly associated with a touch screen, but in a new form which can be sensed in several tactile manners, as well as visually. A tactile selection or adjustment means, such as a knob, slider, or switch, programmable in its tactile or visual nature, and generally operated in conjunction with the touch screen just described. The inventor listed on the patent is Timothy Pryor of Windsor, Ontario, and as we investigated his background we discovered that he is responsible for a concept he calls "Digital Dash", emphasizing a tactile display using knobs and switches that can be dynamically reconfigured via software to provide a multitude of functions based on whatever aspect of the navigation or information system is needed. Consumers can benefit from a personalized control layout and software graphics configuration. Graphics may cover the entirety of the RTD, and these can easily change colors and design. The RTD offers all the telematics and digital entertainment options of other multifunctional solutions while remaining intuitive and easy to use. In examining Pryor's previous patents, we discovered that Apple acquired the rights to a number of his patents and patent applications related to the technology, as well as future patents derived from those works, back in March 2010. A copy of the assignment agreement was filed with the patent office shortly after. 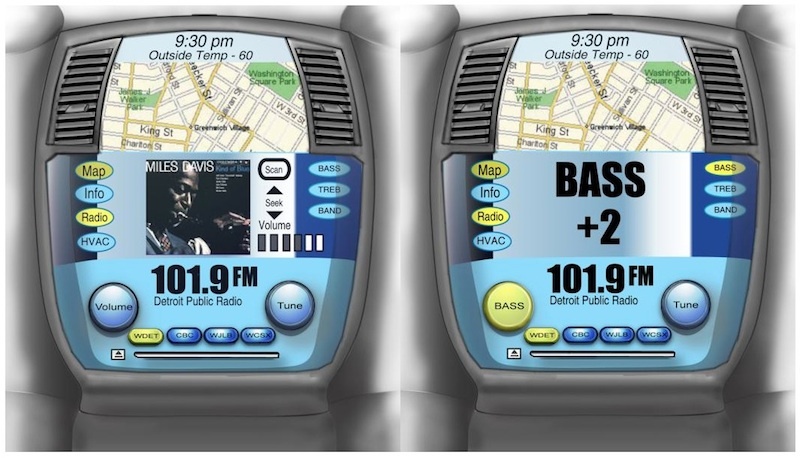 Other patents related to the "Digital Dash" initiative include methods for sensing touch inputs on displays such as vehicle navigation systems, as well as additional details on how in-vehicle displays can be dynamically reconfigured. With the technology detailed in these Digital Dash patents dating back to before their 2010 acquisition by Apple, other options for vehicle integration have of course become possible, with Apple having focused on Siri as a means for interacting with navigation and other services while in the car. Apple rolled out an "Eyes Free" mode for Siri in iOS 6 last year, although carmakers are only just getting around to building support for the feature. Apple is becoming even more ambitious in iOS 7 with "iOS in the Car", which would allow iOS devices to take over in-car displays via AirPlay to provide seamless integration. I mean, Tesla has a large tablet as a control interface and a few luxury car brands have digital dash concepts already in prototype products. However in general I find that On-screen buttons and control knobs goes against the message of safety while driving. Currently with "real" buttons, I can adjust the temp, change the volume, or even the a radio station without having to look at the interface. However with a virtual dashboard, I have to first look to ensure I am on the right view, and then I have to look specifically to ensure my finger is in the right area to change a setting, and maintain sight to ensure I reach the right setting value. Tactile feedback such as the screen vibrating when I am in the right area is not "good enough". This also goes against Apple's "sightless" concepts for bringing more Siri like features into the car that do not require a screen or interface to interact with. Overall while this concept is "cool", it's overall not safe and should be left in an R&D notebook. 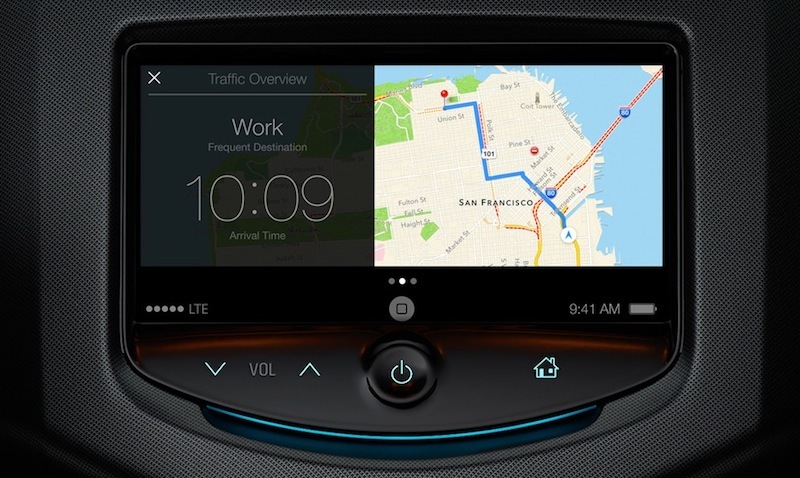 This will also encourage bringing "apps" onto the car dashboard which further distracts the driver from doing the one and only thing that matters while in a car, driving. Someday, some luxury brand will "introduce" analogue controls and people will be amazed at how easy and safe they are to operate. Then, others will copy that and everyone will look at these screens as old fashioned and stupid. Actual knobs and buttons are better than virtual ones in every respect. These screens just impress people who don't know better. 1) Mockups circa the the internet in 1995. 2) This is a great idea and Tesla already has a similar setup in their cars. I have been using a tablet in my car for years and am in the process of mounting an ipad mini in front of my head unit. Nothing beats google maps for navigation!! I hate touch screen controls in a car. Analog old style knobs and buttons that you can turn and push without looking at are the way to go. Touch screen controls that you have to look at to operate are a crash waiting to happen. Worse then using a cellphone while driving to induce loss of driver awareness IMHO. I drove a rental car recently that had all touch screen controls. To change ventilation air from floor vent to defrost required 5 separate pushes of the touchscreen. SELECT CONTROLS... VENTILATION... CHANGE VENT MODE.... SELECT DEFROST ... ARE YOU SURE (YES/NO) :eek:?. Really, like if I pushed defrost by accident the car would blow up! What was the point of the verification screen? Asinine. PITA. I have a vehicle with Ford MyTouch in it, have to say it's an absolutely horrible system. Horrible UI, poor performance and regular crashes (black screens of death requiring me to pull over, stop the vehicle, wait a few minutes, then start the car back up to reboot the system). I've had the HVAC go haywire when MFT has crashed on me as well. I've upgraded my system 3 times so far and I'm not alone in issues with MFT (though there are some people who say they have never had a problem). You know provides the best tactile feedback? Buttons and Knobs! In a lot of areas, texting and driving is illegal (which I'm all for). So...I can't touch one screen sitting in the cubby below my center stack (to text) or I could get pulled over and fined. But if I want to turn the heat up, I HAVE TO touch the screen 3 inches above it and fiddle with that one... equally as distracting. zero sense has been made. 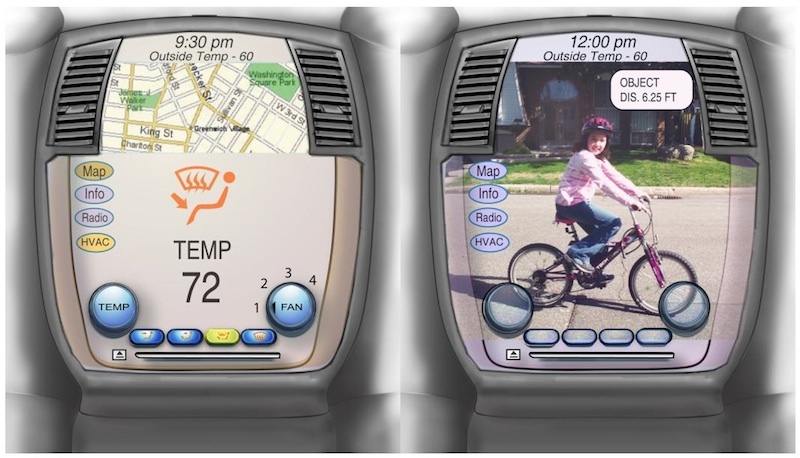 Can't wait to have a car (or buy aftermarket) with just a display and a few buttons that change what they do based on what the screen is doing. My Pioneer AppRadio 2 is ok, but a new version that has iOS in the car would be exactly what I want. I want my iPhone Apps on my car display. - And any other apps that make sense like Dash Command, etc.